Letter #1: Did you see the piece in Fraterna about a new hoya species, Hoya weebella Kloppenburg? Isn’t that the same one featured in The Hoyan several years ago and called “Wee Bella” by you? Surely Mr. Kloppenburg cannot take credit for that name at this late date. Or can he? Also, didn’t I read in The Hoyan that someone else had validly published that particular hoya right after you and Chanin Thorut first featured it in The Hoyan? For a long time I thought you suffered from sour-grape syndrome when criticizing Mr. Kloppenburg’s mania for publishing things over and over again, but I must apologize. I think you are right! The man has completely lost it! I agree with you, enough already! –---- John Lindley (the 21st century “Hoya Nut” - not the 19th century botanist). Reply: No, I didn’t see that – yet! I don’t subscribe because they won’t open mail from me. My mother subscribes and passes it on. I think those people have caught on because poor old mom has to write to them a month or two after each issue is mailed to other people and complain. Then they send it. Some of my friends, who subscribe, complain to me that just knowing me causes the same problem for them. They say that they never receive the paid for bulletins without writing and complaining about not getting them. I went on line and found a picture of the cover of the July issue of Fraterna and found it to be a picture of the “Wee Bella” that was featured the cover of The Hoyan, volume 15, #2. It is the same one Chanin Thorut wrote for the same issue (page 29). At the time, I also pictured several herbarium specimens of this small hoya. As frequently happens when someone, eager to make a name for himself, sees a new plant, that someone jumps head first into the mess and publishes a new name for it. In the case of this “wee bella,” Mr. Kloppenburg was “asleep at the wheel” or has chosen to ignore the fact that P. T. Li beat him to the draw by eleven years. Professor Li not only published this wee bella in 1994, he published it with two different names (Hoya dickasoniana Pl. T. Li and Hoya kingdonwardii P. T. Li). He also published it as Hoya chinghungensis (Tsiang & P. T. Li) M. G. Gilbert, P. T. Li & W. D. Stevems. I believe I demonstrated, quite adequately, in The Hoyan (volume 23, #1, page 5), that the only difference between the “wee bella” and plain old Hoya bella is the size of the plant and its flowers. Chanin Thorut supplied me with three different clones of it. One of those clones had 3 leaves per node. One had two leaves per node with leaves the same size and shape. The third one had two leaves per node with most (but not all) of the leaves small and almost round. Some leaves, however, were the same shape as the other two clones. All the flowers were identical to the larger leafed Hoya bella flowers. When/if I ever see a copy of the Fraterna publication, and see just what Mr. Kloppenburg has written about it, I may have a different slant on it but, as I see it now, this is just another case of a senile old man in a big hurry to make a name for himself, fearing he doesn’t have much time to do it! He’s like the old maid who wanted to get married in the worst way and finally did ----- in the worst way! Ever since publishing those names in The Hoyan in 2001, I have seen my references misquoted, with the names consistently misspelled as “dickinsoniana” and “kingdomwardii” --- Please, if you must write those names, get them right. They are dickasoniana and kingdonwardii. Maybe there is something wrong with me but I was taught in school that the worst insult you could bestow on a person is to misspell his name! P. S. I’m late getting this issue done. Since writing the above, I have obtained a copy of Kloppenburg’s publication of the name Hoya weebella. Somehow I can’t believe that the name is acceptable but I could be wrong. Wrong or not, everything I said about it is correct. The name weebella, which Chanin and I meant only as a nickname, can only be looked upon as a synonym because it already had a legitimate name. The Internet is a wonderful thing! It is also just about the worst thing that could happen to humanity. What makes it so bad? People’s laziness and stupidity! Once upon a time they actually taught children to read in school. In my generation, teachers would not pass you if you could not demonstrate that you understood what you read. I think learning went out the window when TV was invented. A computer screen is just a specialized TV. People use it as a substitute for dictionaries, atlases, newspapers and just about everything else. They think that there isn’t any subject they can’t learn about on it. Proof that one still needs (and ought to use) a real old fashioned dictionary (the kind you keep on a book shelf or between two book ends on your desk) instead of relying on computer dictionaries can be demonstrated just by writing a letter. Encarta (the on line dictionary used by my word processor has told me 47 times in this piece alone that I have misspelled a word and, so far, Encarta has been wrong every time. It doesn’t recognize commonly used words so how can it be expected to recognize anything in the least bit obscure? It has also corrected my grammar and was wrong many times. Computers are dumb! They don’t know anything and they can’t teach you anything that someone hasn’t programmed into them. Real authorities on thousands of subjects don’t spend their precious research time putting it all on line. Scholars and teachers need the validation that comes from legitimate publishing. Often, their jobs and future promotions depend on it. It has been my observation that 99% of the Hoya related websites are put up by rank amateurs, many with only a few weeks hoya growing experience. Example: There is a woman who only had a couple of hoyas. Her name is Tami. She went on the Garden Web Hoya forum and invited its members to visit her web page. I did and was horrified to find that she had copied my web page (The Hoya Page), word for word, in its entirety. There wasn’t even a hint on her web page that I had written that piece. She took full credit. At the bottom she wrote that the page was copyrighted by her and added the usual notice of penalties that would result if anyone copied it or any part of it. To be sure, many wrote congratulations to her on a job well done. I am sure that many who visited her web page considered her to be an authority on hoyas after reading it. In other cases on the same forum, people have written and asked help in identifying a plant (usually it’s* plain old Hoya carnosa var. variegata that they want identified. Invariably another rank amateur will pop up with an URL that should be visited is one wants to see a picture to use for identification purposes. I have checked most of those sites and found only a few hoyas, most of which are mislabeled, yet one “newbie” with no knowledge of the subject thinks she is capable of teaching another newbie. I have been booted from Garden Web and from Dave’s Garden, the two most popular Hoya forums. In both cases, I was booted fore knowing too much! I was booted from Dave’s Garden Forum after telling a particular member who claimed to have gotten a particular species from David Liddle and saying that the identity had been officially authenticated, that she did not have that species because David Liddle didn’t have that species and that there was nowhere that she could get any “official authentication.” David Liddle, himself was very angry over the lady’s claim. He said that he sold it only as “aff.” of the species she claimed was officially authenticated (by David Liddle). It was one he and I had discussed and both of us were in agreement. After I corrected her, she denied having said it so I told her to read all the letters in that thread and she’d see her own letter there making that claim. She got mad at me for pointing out her error and complained to Dave and he booted me. When that happened, the same lady wrote a letter about me on the forum and said, “Hurray, the wicked witch is dead!” People complained about that. Dave did NOT boot her. She’s still there! Letter #2: Next came a letter from Melanie Myers. She said, “I don’t recall reading that. As far as I know, Hoya merrillii is still the correct name. Then again, just when you think it is safe to write a label in ink, it can change. Do you remember where you read it? Letter #4: The writer of the first letter resurfaces with, “NOW I remember… actually I was reading some old lists… it is still called H. sp. CMF-4. I’ll take the questions from the top? Reply to Letter #1: NO, H. sp. NH-1 IS NOT Hoya merrillii. They don’t look alike; they don’t smell alike. One comes from the island country of Vanuatu and the other from more than a thousand miles away in the Philippines. One is a large twining plant with large leaves having 3-5 conspicuous, almost parallel veins. The other is a dangler with no visible veins. Reply to Letter #2: Letter #2 needs no reply! This writer kept her feet out of her mouth! NOTE THAT NOTICE ONLY SAID THAT A PICTURE WAS MISLABELED. IT DID NOT SAY, (OR EVEN INTIMATE) THAT Hoya merrillii was anything except Hoya merrillii or that Hoya quinquenervia was anything other than Hoya quinquenervia. To any who interpreted that to mean anything more than a mislabeled picture, I strongly suggest a remedial reading course! And, save your blessings for someone who needs them. I’m already blessed with the greatest blessing of all – a brain! Reply to Letter #4: Neither NH-1, Hoya merrillii nor Hoya quinquenervia has ever been listed on any old lists that I ever heard of as CMF-4. CMF stands for Charles Marden Fitch, the famous flower photographer and writer on plants and garden subjects. He found several hoyas on a trip to the orient back in the 1980s. He sent cuttings of all he found to me. I presume that Mr. Fitch numbered his collections in the order he found them. He collected other things besides hoyas and I’m pretty sure that his #4 was not a hoya because there was NO CMF-4 among those he sent to me. Since he does not have a nursery and never put out a catalog or a list, I also pretty sure that I was the one who distributed all of those CMF numbers. If it was a hoya, it must have been either Hoya obscura (he sent two clones of it) or Hoya cumingiana, which I was able to identify immediately so no number was needed. Reply to Letter #5: This needs no reply. Reply to Letter #6: Lady, I consider your letter to be the epitome of “Brass Monkey” brass? You got me booted from that forum and rejoiced that I was booted by writing, “Hurray, the wicked witch is dead!” Obviously, your parents were very remiss in failing to teach you not to bite the hands that feed you! Believe me; I wouldn’t give you the time of day, if it weren’t for the fact that your misinformation is misleading to others. I just don’t think others should be misled by you. So, what is Hoya quinquenervia? Despite the reams of words written about Hoya quinquenervia by R. D. Kloppenburg in his various publications, there is NO WAY on earth for anyone to prove or disprove the identity of a hoya published by Otto Warburg as Hoya quinquenervia. The holotype of it was one that was destroyed by Allied bombing during WW-2. There was NO DUPLICATE! Proof of that is found in Warburg’s original name publication, in his statement, “Folio unico exstante,” (the first 4 words of his publication). That means “One leaf extant.” Although you can find leafless specimens in herbaria, those specimens are leafless because the leaves fell off the specimens after they were mounted and deposited there. One simply doesn’t make a specimen of something without anything but empty stalks unless one has reason to believe that it is the nature of the species not to have any. Warburg did mention another specimen found next to the one he called Hoya quinquenervia, saying that it had no flowers except some damaged ones lying on the ground beneath the plant so that he wasn’t sure if they belonged to that plant or not. Mr. Kloppenburg appears to be completely obsessed with Hoya quinquenervia. He has written much on the subject. It seems to me to be a study in futility to spend so much time trying to prove that a hoya is this species when there are so many things with ample type material still extant which need to be identified. In two versions of his Philippine Hoya Species, he actually had to unmitigated gall to use a series of very crudely drawn pictures of the various flower parts and labeled them as being the flowers of Warburg’s holotype specimen of Hoya quinquenervia. There is only one way to sum that up. It was fraud, pure and simple. There is absolutely no possibility that Kloppenburg ever saw Warburg’s holotype specimen, nor even an isotype. None exists and none has existed since WW-2. What’s wrong with that? In the first place, Kloppenburg inserted some commas in places where they didn’t belong. Warburg did not say, “Folio unico, exstante.” He said, “Folio unico exstante.” To put the comma there indicates that two statements were being made. Warburg only made one statement. Next, the word “folio” is singular which shows that only a single leaf was being described. The word “unico” does not mean “unique” as Kloppenburg says. It means, “One and no more, single, solitary, growing singly, etc.” (Stearn’s Botanical Latin 4th edition, page 521). There does not appear to be a Latin word for “unique.” I looked for one in four different Latin dictionaries and none had such a word. It appears from what I found that the closest thing to it is “unlike.” It appears that if one wanted to say (in Latin) that a hoya was “unlike” any other, the word or words one would use would be, “dissimilis,” “dispar,” or “diversus.” The word “exstante” could mean “standing out” in the sense of “projecting outward” but its usual meaning is, “to be still in existence, to be extant.” In none of my dictionaries could I find a meaning “outstanding” in the sense implied by Kloppenburg. As for the glossiness and deep green waxy foliage that he claims, “certainly stands out,” I say he was putting words into the mouth of Warburg that Warburg never implied. Nowhere in Warburg’s description did he mention leaf colour. The only other publication (prior to the copious writing on the subject by Kloppenburg) was one by A. D. E. Elmer, in Leaflets of Philippine Botany 10(131): 3591 (1938). Elmer claimed to have collected the same species and said that the leaves were “equally green on both surfaces.” He did not say if that green was dark, light or in between, nor did he say that they were glossy. He did say that “the flowers are yellow.” I’m inclined, however, not to believe much of what Elmer had to say because I have found so many provable errors in almost everything he wrote. Merrill’s entry for this species in his Enumeration of Philippine Flowering Plants said nothing about the species. It was only a list of herbarium specimens he found in the Bureau of Science with the names of the collectors and their collection numbers. With only a single leaf still in existence on the holotype specimen and no duplicates for comparison, none of us will ever know exactly what species Hoya quinquenervia is. I think it time we just wrote it off and went on from there. It has surely been republished as something else since and most likely had been published as something else before Warburg ever happened upon it. Other erroneous things written about Hoya quinquenervia and about one Kloppenburg claims to be that species, in Fraterna, in Phillipine (Sic) Hoya Species, Phillipine Hoya Species, Hoya Pollinaria, a Photographic Study, World of Hoyas 1, World of Hoyas 2 and other places. Phillipine (Sic) Hoya Species - On page 99 he shows 8 drawings labeled as “Hoya quinquenervia (Sic) Warb. # 11956.” That is an out and out fabrication. Warburg #11956 hasn’t existed since late in WW-2. Kloppenburg never saw it so there is no way he could have drawn pictures of its flowers!!!! The flowers are not in the least like those described by Warburg. Warburg said that the corona lobes were “not at all recurved acuminate.” His phony sketches show a corona lobe that is very definitely recurved and very long-acuminate. Warburg described a glabrous calyx but Kloppenburg’s fraudulent sepal sketch shows it to have quite a lot of hairs on it. Whether any of the other parts are accurate for the species is not known as Warburg’s description was not complete enough to even get a hint. Elmer’s follow up was even sketchier! Philippine Hoya Species, 2- Just the same as the above. 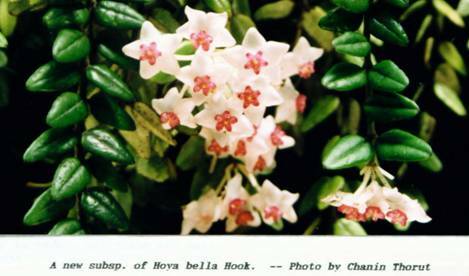 Hoya Pollinaria, a Photographic Study – Kloppenburg lists this in a section he called, “Philippine Palmate Leaf Species.” In it he listed a specimen, “Here (Sic) 1013 labeled Hoya quinquenervia. Above is a picture of a leaf found on Herre #1013. I don’t see any palmate leaf venation there. World of Hoyas 1 & 2 Here he described Hoya quinquenervia as having “very attractive, large glossy waxy deep green foliage, with rounded bases and short acuminate tips.” He pictured dull, light coloured foliage with bases cuneate-angustate (having convex curved sides narrowed abruptly and concavely to the base)—see Stearn’s Botanical Latin 4th edition, page 321. The leaf tips in his picture (same in both editions), are rounded and completely obtuse. 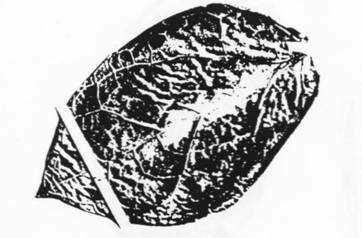 Shape is elliptical, while the only leaf described by Warburg was almost round except for an acute apiculation at its apex. With only a single leaf described by Warburg (the only leaf left on the plant) there is no way of knowing if that leaf was typical or if it happened to be the only leaf of that size and shape that would have ever appeared on the plant. In addition to that, I have seen and grown the plant that Kloppenburg alleged was this species and its foliage looks nothing at all like that pictured in these two books! What is Hoya merrillii? Answer: At this point I don’t know. I thought I did once but after several more years of study, I have become confused over it. The one I thought was it; CMF-9 is identical to Schlechter’s type in every respect except one. The corona lobes, seen in profile, do not stand straight upright. The only hoya I’ve found that has those upright coronas (if Kloppenburg’s photos are accurate – many aren’t) is the yellow flowered form of Hoya blashernaezii. Foliage of Hoya blashernaezii doesn’t match, nor do the flower petals. Hoya pentaphlebia flowers match those of Hoya merrillii except for the upright corona lobes but the leaves don’t match very well. I have concluded that there needs to be a lot more study of the trinerved and quinquenerved Philippine species before we’ll be able to accurately place many of them in their proper places. The Internet is a wonderful thing but you must remember that it doesn’t carry an imprimatur of accuracy. Most of the Hoya sites are written by and for people who only think they know all about hoyas because they inherited one from their grandmother a year ago, two years ago or forty years ago. You can’t get anything out of a computer that someone didn’t put there. It is obvious that, at this time, 90% of those with the time and inclination to put Hoya information on line, only think they know something about hoyas, when, in fact, they know little to nothing.